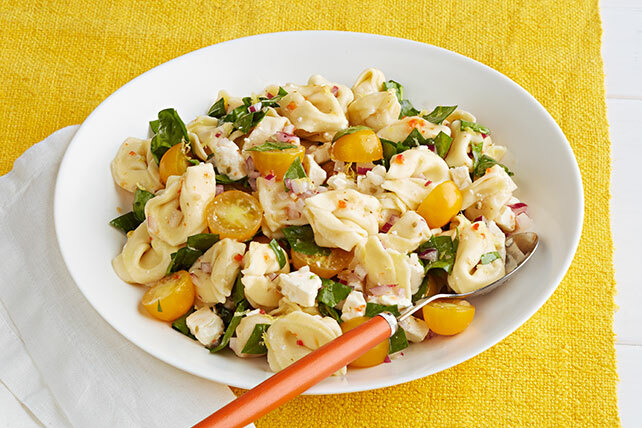 Try our Lemony Tortellini-Spinach Salad for a refreshing summer bite. This recipe calls for onions, tomatoes, feta, spinach, lemon, tortellini and more! Prepare using red cherry tomatoes or grape tomatoes. Omit the suggested refrigeration time. One medium lemon yields about 3 Tbsp. juice. To get the most juice from lemons and other citrus fruits, bring the fruit to room temperature. Use your palm to gently press and roll the fruit on the countertop a few times to release the juices inside before squeezing.